Brian Timoney put it perfectly, “agile mapping” is where we need to be. His?expertise?in the energy sector, plus the ability to mix in some PostGIS and he can deploy a map quickly and?effectively. Everybody has been using Google Chrome for screen shots, so why not me? We were talking shop the other day and a couple of us lamented the need to have an ArcGIS Server license to use ESRI’s map cache generator. While I have no problem using Arc2Earth to generate tiles I can integrate into Google Maps or Virtual Earth, it seems like such a no brainer to give ArcGIS Desktop users (heck even just ArcInfo users) the ability to use ESRI’s map tile generator. 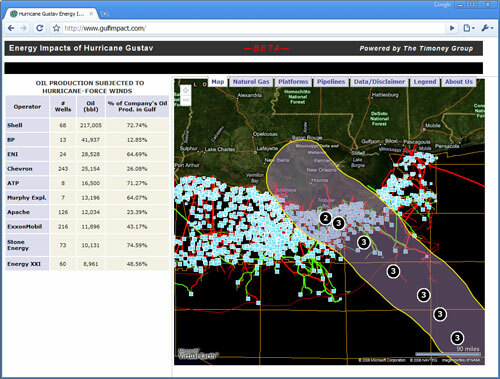 ArcGIS Server has its place, but when wanting to put up timely maps such as Brian’s Energy Impact site, you need the ability to go from ArcMap to Google Maps with one click.